Handmade, fresh pasta not only has a glorious, silky texture, but adds a little something special to a home-made meal. It's not necessarily tricky to make, either and you don't even need any fancy equipment (a rolling pin and a sharp knife will do, but a frilled-edge pastry cutter and a pasta machine can also help, if you have them). These two examples of hearty, traditional northern Italian dishes - cappellacci alla zucca, or pumpkin-filled fresh egg pasta, and pizzoccheri valtellinesi, buckwheat pasta with cheese, potatoes and silverbeet - celebrate seasonal vegetables and the arrival of the cooler weather. Ferrara's favourite autumn dish and symbol of the city, cappellacci alla zucca, are large, plump versions of tortellini with a roast butternut pumpkin filling, a dish that dates to the Renaissance. While it can be served with a meat ragu, this meat-free version is undoubtedly the best way to serve it - a simple butter sauce infused with fresh sage leaves. Homemade pasta cappellacci alla zucca. To prepare the filling, first roast the pumpkin (seeds removed, skin on), with some olive oil. When cooled, remove the pulp with a spoon and place in a bowl with the rest of the filling ingredients and combine. The mixture should not be too wet, but you can add more breadcrumbs or parmesan if needed. Set aside. To prepare the pasta, place the flour on a clean surface, create a well in the middle of the flour and add the eggs and yolks. Using a fork, whisk the eggs together and slowly incorporate the flour until the mixture becomes creamy and eventually becomes too thick to continue whisking. With floured hands, finish combining the flour until the dough no longer sticks to your hands. Depending on the size of the eggs, you may not need all the flour or you may find the mixture too dry - in this case, you can add a bit of water until you have a dough you can work with. Knead on a floured surface for about five minutes or until it becomes smooth, elastic and a finger poked into the surface of the dough bounces back. Let the dough rest, covered with a damp cloth, under a bowl, or in cling film, for at least 30 minutes. 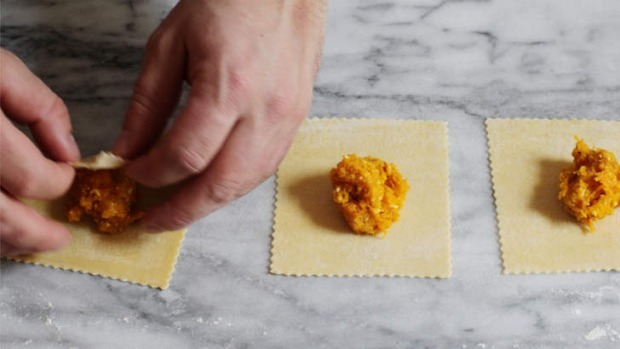 Divide the rested pasta dough into four pieces, and, keeping the pieces that are not in use covered, roll out the pasta into sheets you can see your fingers through. With a frilled-edge pastry cutter or a sharp knife, divide the sheets into strips about 5-6cm wide, and then into squares the same width. Place a heaped teaspoonful of mixture in the centre of each square and on two of the sides, dab or brush some water (or if you've saved the egg whites from earlier, you can use beaten egg white). Then fold one corner of the pasta to the other to make triangles, carefully pushing out any air from the centre towards the edge before sealing. Next, fold the outer corners of the triangle together and seal by pressing down gently - this part of the cappellacci will essentially have four layers of pasta dough, so pressing will serve to make sure it's not too thick and chewy. 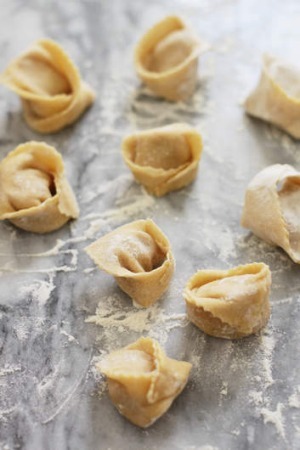 Let the cappellacci rest and dry out a little (up to an hour) on a floured board or cloth before cooking. Cook the cappellacci in a pot of salted boiling water until they begin to float, around six minutes. In the meantime, prepare the sauce by melting the butter in a skillet over medium heat until it turns caramel-brown. Add the sage leaves and let them infuse in the butter. Add a ladle of the water that the cappellacci are cooking in and whisk to create an emulsion. 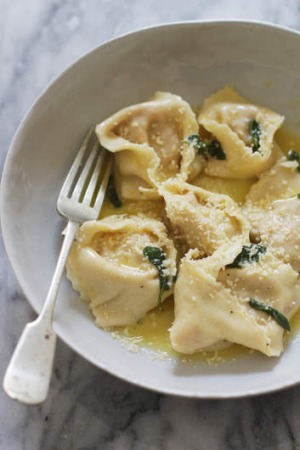 When the cappellacci are ready, remove them with a slotted spoon and place in the sauce, gently coating them. Serve with grated parmesan cheese. Pizzoccheri are handmade buckwheat pasta (a bit like short tagliatelle) from the Valtelline valley not far from Lake Como. The humble ingredients of this dish - buckwheat flour, water and sturdy winter vegetables, might deceive you into thinking this is a plain dish, but when you add several huge handfuls of cheese and a good dose of Alpine butter, melted to a glorious frothy, golden hue, you have a rich, satisfying dish that will leave you wanting for nothing. It is a dish that locals don't mess with so this is the official recipe directly from the Accademia del Pizzocchero (yes, it has it's own academy). The most traditional combination is potatoes and savoy cabbage but silverbeet or green beans are often used instead. While the cheeses used are either the Valtellina Casera DOP or Bitto, a close, if unorthodox, substitute would be Gruyere. Combine the two flours in a bowl and gradually add the water, mixing until well incorporated. Work the dough for a few minutes. It should be smooth and compact, but not dry or crumbly and it shouldn't stick to your hands. If it's dry, add a little more water until it becomes smooth. Rest the dough for at least 30 minutes. Roll the dough out with a rolling pin to a thickness of roughly 3mm. With a sharp knife, cut the dough into large strips about 7cm-8cm wide then cut these into short pasta strips about 1cm thick. Prepare the vegetables - if using savoy cabbage, slice out any tough stalks then chop into small pieces. If using silverbeet, cut out the central stalk and chop the leaves. Boil a large pot of water, add a few pinches of salt and begin boiling the potatoes. After a couple of minutes, add the greens. After five minutes, add the pasta and let cook a further 10 minutes. Meanwhile, in a separate pan, melt the butter with the garlic and brown the butter. Set aside until the pasta is ready. Remove the pizzoccheri and vegetables from the pot with a slotted spoon and place on a large, warmed platter. Scatter a handful of cheese over the top, drain more pizzoccheri and scatter again with cheese; repeat until you have removed all the vegetables and pizzoccheri from the pot and the cheese is uniformly distributed through and on top of the dish. Finally, pour over the browned butter. Serve as is (don't mix it!) with plenty of freshly ground black pepper.